N. Mijnders Melissant B.V. is a certified coach company founded in 1928. Situated in South-Holland, just 50 kilometers away from Rotterdam (Europoort, Botlek, Maasvlakte, Hellevoetsluis) and on the edge of the province Zeeland (Port Zeelande, Brouwersdam, Brouwerseiland) our company is ideally located to provide you with expertly organised trips. 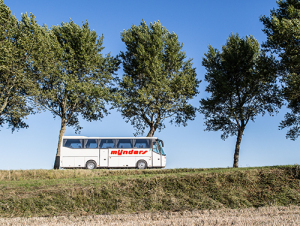 Offering chauffeur driven coaches alongside other transport services for over 80 years, we are proud organisers of trips throughout the Netherlands and Europe. 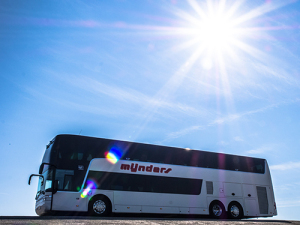 You will be greeted by a small team of enthusiastic and experienced drivers, who can offer you every luxury as a customer in any one of our varied and modern coaches. Our fleet accommodates seating for groups ranging from 30 places on the smaller coaches to 90 seats on our popular double deckers. The modern wheelchair coach, fully equipped with lift and removable seats, has room for 13 wheelchairs. The 5-star First Class coach is complete with luxurious leather reclining armchairs, foot and arm rests, USB connections, a double fridge and a lavish Lavazza coffee machine. All coaches are equipped with modern security systems, toilets, air-conditioning, fridges, radios, dvds, and seat belts. Your group leader is entitled to make free use of our onboard microphone. Would you like your group to be picked up from a hotel or campsite, or to arrange a complete, organised trip in Holland or abroad? We are pleased to arrange tailored solutions for groups such as companies, schools, social organisations, holiday-makers and more. Our helpful and cooperative staff is always on hand to coordinate the ideal itinerary for your group. With N. Mijnders Melissant B.V., you can be sure to enjoy a relaxing day out in a calm atmosphere assisted by our friendly and helpful staff. Our vast knowledge enables us to offer you day-trips to week or month-long excursions to suit your wishes. Feel free to contact us by Phone + 31 187 601077, e-mail info@nmijnders.nl or by completing the form below. Is the departure address the same as the return address?